See Part 1 on calculating private equity returns here. When it comes to private equity investing, investment returns is considered a taboo subject as the asset class is so risky. In some cases, the high risks can lead to high returns, but investors need to be wary of thinking that other people’s average returns are a guide for how any individual investment will play out. A lot of the figures used in this article are from overseas sources and may cover slightly different company stages and investing methods. We have aimed to select a wide range from angel, venture capital and private equity to cover a variety of companies and use local New Zealand data where possible. Finally, past performance is no guarantee of any future performance, in most endeavours, especially investing. In the world of private company investing, a lot of the metrics you’ll read about are based on estimated returns that have not yet been “realised” rather than actual returns. Estimated returns are useful because investments in private companies can take a long time to come to fruition and the price for a recent transaction, such as a capital raise, is a strong indicator of performance. However, until the money is back in your bank account - a “paper return” isn’t yet an ‘asset’. The below data looks mainly at fully realised returns, but it’s also worth keeping your eyes open for unrealised returns whenever you’re looking at returns data. The Yale Endowment fund is one of the most widely cited examples of the returns possible from investing in private companies. The fund has earned 18 per cent per annum on their investments in venture capital over the last 10 years. NZ Super has earned 14.7 per cent on its investments into a mix of investments into private equity funds and direct investments into private companies. The American Angel Association found in 2007 that angel investors investing as part of an angel group had an average return of 27 per cent across a sample of over 500 angel investors. The Kauffman Foundation found that their own investments in over 100 venture capital funds (around $250 million invested) returned a sobering 5 per cent IRR over the 10 years from 1999 to 2009. However, this period included a major downturn in the technology sector (‘the dot-com bubble’) which influenced returns. According to leading investment consultancy Cambridge Associates, the 30-year average annual net return for expansion-stage growth and venture funds was 12.6 per cent in 2014. UK research by NESTA found that angel investors generated an average IRR of 22 per cent over four years. Investors on US venture capital platform SeedInvest have generated an average unrealised IRR of 17.4 per cent on $78 million invested through the platform since its founding in 2012. UK based Seedrs has generated a platform wide unrealised IRR of 12.02 per cent across 577 deals. 52 per cent of all exits returned less than the capital the angel had invested in the venture. 7 per cent of the exits achieved returns of more than 10 times the money invested, accounting for 75 per cent of the total investment dollar returns. In New Zealand, we've seen recent returns to investors range from exits such as 2.5 times for SwipedOn after one year (an IRR of 250 per cent), to a total loss of all the capital invested. 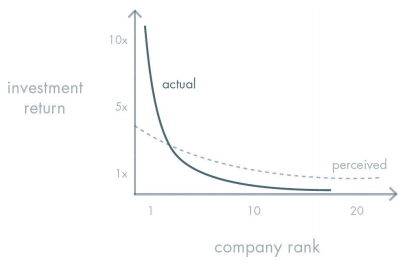 It's easy to assume that there's a nice smooth bell curve so that the returns most commonly land around the IRR "averages" discussed above, however, the distribution of private company returns more closely follows a "power curve" with a small number of high returns and a large number of negative or close to zero returns. Armed with the information on realised returns, average returns and variability you are now better equipped to build a strategy for your own investments into private companies. The key tools include discerning due diligence, proactive diversification across industries, geographies and company stages, and forward planning for allowances to invest in follow-on funding rounds to back your winners. Piers is a Director of Growth Capital at Snowball Effect. He leads engagements with high quality, growing companies seeking capital. Piers has a diverse professional background in banking, finance and investments.